Eli Badra holds a master’s degree in Music Education from the Boston Conservatory. He currently teaches piano in Cambridge, Massachusetts, and at Berklee College of Music in Boston. He has a long-held interest in how music-making reflects its culture, and his work focuses on the intersection of musicology and video games. Music has the unique ability to bring people together and speak to them on a fundamental, subconscious level (for more on this, see Ehrenberg and From Lullabies). 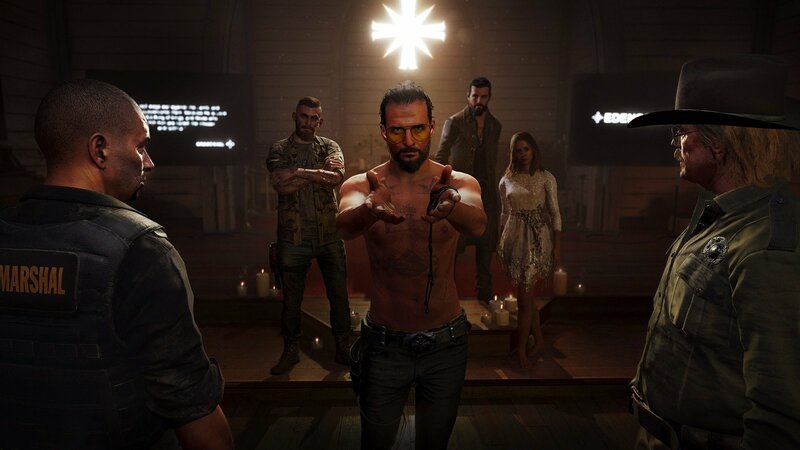 This aspect of music plays an important role in the narrative of Far Cry 5 (Ubisoft, 2018), as Joseph Seed, the game’s primary antagonist, uses music as a powerful tool for recruiting people into his doomsday cult, the Project at Eden’s Gate. Indeed, Far Cry 5’s music ties more closely with its narrative than any previous game in the series; by exploring its music, we may better understand the populist belief system that underlies Joseph’s “fringe” doomsday preaching. As this essay will demonstrate, a tension arises between how Far Cry 5 presents its cultists as anonymous, brainwashed non-player characters (NPCs) suitable for little more than cannon fodder, and the very real classist struggles that belie this presentation. 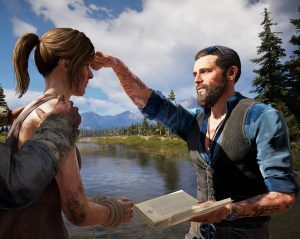 In order to put Far Cry 5’s music into a historical context, this essay will also examine how the intermingling of folk- and sacred-music in the 20th century created a more accessible form of worship and thus changed the landscape of Western Christianity. In Far Cry 5, Eden’s Gate has taken over Hope County, in rural Montana, and the player helps mount a resistance against the cult. In doing so, they will face three of Joseph Seed’s siblings – Jacob, John, and Faith – each of whom fills a different role in Eden’s Gate: Jacob is in charge of security and recruitment; John is the family lawyer; and Faith manufactures the drug Bliss, which is used to brainwash cultists and keep them in a state of disoriented euphoria. After defeating the three siblings, the player confronts Joseph in a final encounter. From a strictly gameplay-based perspective, the player stands in direct opposition to Eden’s Gate; examining the music that one hears throughout the game, however, reveals a great deal about the cultists’ beliefs and Joseph Seed’s teachings. The Seed family (left to right: John, Joseph, Jacob, Faith). Screenshot. Far Cry 5’s music stands out thanks to the compositions of Dan Romer. In an interview with NPR, Romer states that Ubisoft approached him with a copy of the Eden’s Gate’s bible and asked him to write ten hymns “for brainwashing…and recruitment purposes,” the results of which may be found on three albums, each representing a different interpretation of those ten hymns (Shapiro). (I have compiled these albums into Spotify and YouTube playlists for the reader’s convenience). In the early 20th-century, English folk-music experienced a cultural revival thanks in no small part to the efforts of the clergy (Luxmoore, Ellis, 2014). Particularly noteworthy is the work of Reverend Sabine Baring-Gould (1834-1924), who compiled a lengthy volume consisting of more than a hundred folk songs, entitled Songs and Ballads of the West. Baring-Gould traveled throughout Europe, listening to old performers and transcribing the music that would have died with them (Baring-Gould ix). The reverend saw the value of incorporating folk-music with the sacred: he wrote the text for “Onward, Christian Soldiers” and had it set to a march tune composed by Arthur Sullivan, of Gilbert & Sullivan fame (Shepherd). Similarly, English composer Ralph Vaughan Williams (1872-1958) saw success in arranging about seventy folk tunes into 1906’s The English Hymnal, synthesizing secular melodies with sacred texts. The closest historical analogue to Eden’s Gate, at least musically, may be found in the work of Reverend Conrad Noel, a British minister who became the vicar of Thaxted, Essex in 1910. Known as the “Red Vicar,” Noel flew the red flag of socialism and the flag of Sinn Féin, a left-wing Irish political party, within the church, despite a consistory court forbidding it (Noel 115). Noel and his wife “consciously drew on folk traditions in dance and music in order to create a culture which was independent of the mass commercial productions and milieu of their day” (Heywood 45). With the efforts of people like Baring-Gould and Noel, the stage was set for greater musical participation among parishioners in Western churches. In order to foster that participation, the early 19th-century saw the advent of four-shape tune books, also known as “fasola” solmization, which assigns syllables (fa, sol, la, mi) and shapes to the notes of the diatonic (major/minor) scale. Doing so allowed those who could not read traditional notation to more easily pick up a songbook and participate. (Lia Grayson’s beginner guide to fasola provides a more thorough explanation of its history and how to read it). Fasola made it possible for folks to sing along regardless of their level of musicality. This eventually led to the “gospel hymn,” a term coined by Ira D. Sankey in 1875. 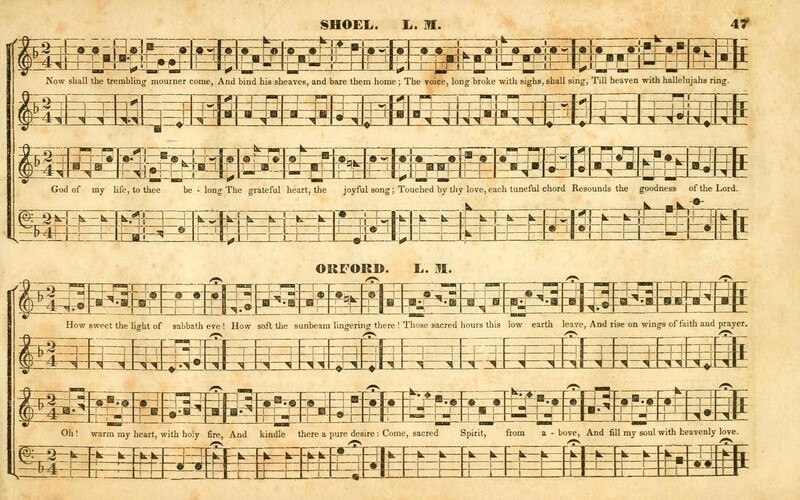 Particularly in the American South, gospel hymns evolved to “often have melodies that use pentatonic and other scales inherited from the folk hymn tradition” (Eskew, Downey). It is a small lateral step to move from gospel hymns to the Christian rock music that we hear today. This history of folk-music’s influence in the church helps to contextualize Romer’s hymns in Far Cry 5. “It’s all kind of centered around Americana music,” he explains, “Like banjos, mandolins, fiddles, accordions, those kind of American folk instruments, but then supported by super-aggressive electronic and organic percussion” (Shapiro). 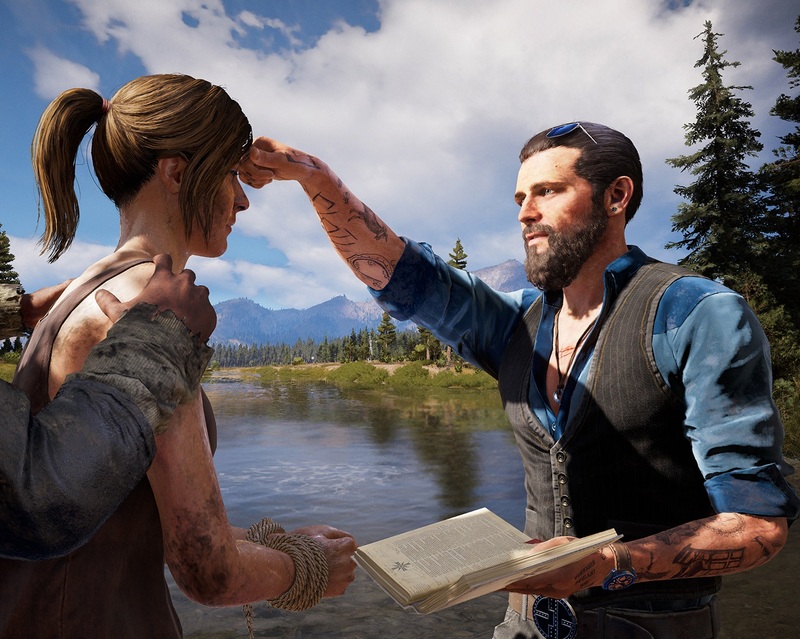 By playing music (and it plays everywhere in Far Cry 5) that appeals to secular tastes, Eden’s Gate casts a wide net in which to ensnare potential converts. Those converts are taught to believe in The Great Collapse, a world-ending catastrophe that sits “at the heart of Eden’s Gate’s eschatology” (MacLeod, paragraph 6). In addition to foretelling this apocalyptic event, Eden’s Gate’s teachings focus on nebulous ideas of penitence for one’s sins, the aggressive pursuit of salvation for non-believers, and remaining steadfastly loyal in the face of outside aggressors. When we listen to the hymns of Eden’s Gate, however, a more nuanced picture begins to form. For example, the song “The World is Gonna End Tonight” offers a sense of community and togetherness, while declaring that non-believers will suffer. “Oh John” is a warm and joyous declaration of the absolution that awaits those baptized by John Seed (Joseph’s brother).It is easy to imagine a real-world church full of dancing parishioners declaring “Oh John!” as they listen to the lead singer praise his greatness. John Seed performing a forced baptism. Screenshot. This song argues that modern society is indulgent and irredeemable, and it is only through the teachings of Joseph Seed and loyalty to the community that true salvation may be found. A fierce expression of the class struggle that lies at the heart of Eden’s Gate’s ethos pervades these hymns. “We Will Rise Again” presents a world that has left these people behind, as Western society molds itself to give more to those who already have, and to forget those who have not. That “we” are rising “again” implies not necessarily a revolution, but a return to an egalitarian ideal (which may or may not have ever existed). The piece humanizes a group of people who Far Cry 5’s gameplay and script paints as mindless targets for destruction. “Let The Water Wash Away Your Sins” similarly postulates that those in power merely take steps to consolidate and increase that power, and do little to help those in need. Through Eden’s Gate, those forgotten by society find a community that understands them, and a solution to the almost incomprehensible inequality that defines that society. In contrast to these brisk and energizing pieces intended to bring people together with simple refrains, the song “Help Me Faith” is about finding faith through personal struggle – a lullaby that weaves easily through hope and despair. The subject laments a life spent in “shackles,” alone and without true love, finally dying outside of “the light,” full of regret and disillusionment. The verses circle a dark, minor chord progression, propelled by the sparse plucking of a mandolin and held aloft by long, ethereal synth lines underneath. The chorus pleads with Faith to “shield me from sorrow, from fear of tomorrow,” to help ease the horror of the impending Collapse. Far Cry 5 presents Faith as a protective figure, especially during the player-character’s Bliss-induced hallucinations: she holds your hand and coddles you, stroking your face as she leads you through this strange dream world. She is warm and kind, barefoot as she spins playfully under a massive tree with arms outstretched. Grasping your palms, she literally lifts you up, and the two of you float above the ground as she smiles and proclaims the power of Joseph Seed. As the chorus calls out to Faith directly, the harmony begins its ascent. With the second declaration of “help me Faith,” the orchestration breaks into a major chord as the singer asks her to protect us from the “worry and madness” of our world. As the singer asks Faith to “lead [her] to the Bliss,” we descend again into our minor key, perhaps giving away the dark secret of what Bliss really is. Dan Romer presents all of this – warnings to those who ignore Joseph’s word, the greatness of John, the strength of the group, the maternal warmth of Faith, the inevitable judgment that awaits those in power – as music that is more “Americana” than “sacred,” as it sidesteps much of the religiosity of Eden’s Gate. The music’s “Americana” style, which the Americana Music Association defines as “contemporary music that incorporates elements of various American roots music styles, including country, roots-rock, folk, bluegrass, R&B and blues,” increases its accessibility. Its cultural pervasiveness means that many people living in America will likely be familiar with its stylistic features. By pulling from a number of cultural traditions, this music also has a potentially broader appeal across social groups and ethnicities. Romer’s orchestration works hand-in-hand with the subject matter, as empowering lyrics weave in and out of the familiar tropes of Americana music, creating a final product catered to wayward souls looking for a community and a sense of purpose. Far Cry 5’s visual language does little to express the emotional connection between followers of Eden’s Gate. However, the songs they sing readily express that renewed sense of purpose, that righteous fury against an uncaring (if not downright hostile) upper class, that feeling of community, and that promise of a brighter future – even if it means destroying the world and starting over. As players, we gun down hundreds, if not thousands, of these desperate people, and the game never really seeks to challenge our perception of what we are doing. 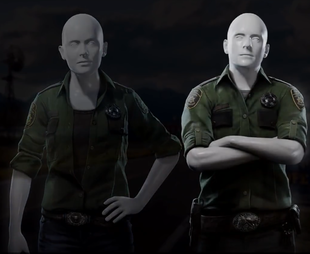 We control a nameless, faceless, voiceless deputy who arrives in Hope County and, with minimal information, begins killing people almost immediately. It is telling that John Seed declares the player-character’s sin to be “Wrath,” perhaps implying that it is our destiny to wreak such havoc. This is not to excuse the cultists’ actions, as they engage in their own share of horrible behavior, including torture and murder. However, while the player-character engages in such violence for no particular reason (or because players have been well-trained to destroy whatever is in front of them when the crosshairs turn red), the cultists are trying to defend and expand a community that has accepted them and promised a better future. Our first view of Far Cry 5’s player-character. Screenshot. 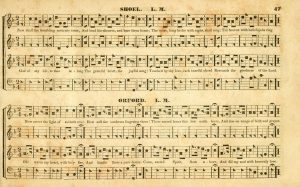 Eden’s Gate offers a hymnal that, aesthetically, would be familiar to most Americans, creating an effective avenue through which to convey what Joseph Seed really preaches. 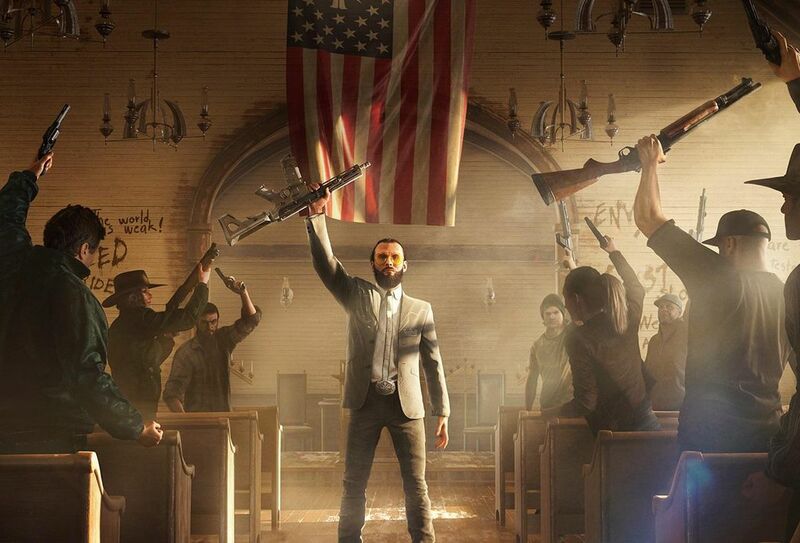 On the surface, Far Cry 5’s antagonists are cultists who shout generic religious condemnations as they charge at you with weapons drawn. However, Dan Romer’s compositions are as important a part of Far Cry 5’s text as its visual presentation, and through examination of those compositions we see a collective whose concerns align with many of today’s real-world concerns. Studies suggest that we respond to music more directly than other forms of stimuli, and indeed we are evolutionarily inclined to its consumption – it bypasses our critical mechanisms and accesses our emotions directly. And so, when paired with a forceful message, music is unique in its ability to bring people together under a shared belief system or objective. As the band swells and your neighbors sing about taking back a world that you increasingly fail to recognize as your own, your hearts beating in unison, delirious and tripping on Bliss, how easily do you think you could resist Joseph Seed’s teachings? Although there is a great deal of scholarship surrounding video game music, there is relatively little discussion as to how that music’s historical context informs the text of the game as a whole. As with all art, music reflects the people and times in which it is written. Analyzing the musical lineage of Far Cry 5’s compositions, and performing a close reading of those compositions, yields a more nuanced understanding of its antagonists. Ultimately, we see how the many tools available to game creators can be utilized to uniquely represent certain groups of people, and how gameplay, narrative, graphics, and, of course, music can meld together to create potentially powerful moments of revelation and sympathy. Baring-Gould, Sabine. Songs and ballads of the west: a collection made from the mouths of the people. London: Methuen & Co., 1891. Internet Archive. Web. 27 Sep. 2018. Cognitive Neuroscience Society. “From Lullabies to Live Concerts: How Music and Rhythm Shape Our Social Brains.” NeuroscienceNews, 30 March 2018. Ehrenberg, Rachel. “Brain waves of concertgoers sync up at shows.” ScienceNews, 28 March 2018. Eskew, Harry, and James C. Downey. “Shape-Note Hymnody.” Grove Music Online, Oxford University, 22 Dec. 2017. Hall, Jacob Henry. “Lowell Mason.” Biography of Gospel Song and Hymn Writers, AMS Press, 1971, p. 17. Heywood, Andrew. “Gustav Holst, William Morris, and the Socialist Movement.” Journal of William Morris Society 11, no. 4 (spring 1996): 39-47. Luxmoore, Jonathan, and Christine Ellis. “Folk Music Is in Tune with Church.” Church Times, 23 May 2014. MacLeod, Riley. “Far Cry 5’s Religious Radio Station Reveals A Different Side Of The Game.” Kotaku, Gawker Media, 9 Apr. 2018. Noel, Conrad. An Autobiography. London: J.M. Dent & Sons Ltd., 1946. Onderdonk, Julian. “The Cambridge Companion to Vaughan Williams.” The Cambridge Companion to Vaughan Williams, by Alain Frogley, Cambridge University Press, 2014, pp. 136–156. Romer, Dan. Far Cry 5 Presents: Into the Flames (Original Game Soundtrack). Ubisoft Music, 2018. Schäfer, Thomas, et al. “The Psychological Functions of Music Listening.” Frontiers in Psychology, vol. 4, 13 Aug. 2013, doi:10.3389/fpsyg.2013.00511. Romer, Dan. “An Americana Hymnal for the Doomsday Cult of ‘Far Cry 5.’” All Things Considered, interviewed by Ari Shapiro, hosted by Ari Shapiro, National Public Radio, 27 March 2018. Transcript, . Accessed 27 Sep. 2018. Shepherd, Marc. Discography of Sir Arthur Sullivan: Recordings of Hymns and Songs, Gilbert & Sullivan Discography, 11 July 2010.